West wall of Pentagon, Arlington County, Virginia, U.S. The hijackers crashed the aircraft into the western side of the Pentagon at 09:37 EDT. Many people witnessed the crash, and news sources began reporting on the incident within minutes. The impact severely damaged an area of the Pentagon and caused a large fire. A portion of the building collapsed; firefighters spent days working to fully extinguish the blaze. The damaged sections of the Pentagon were rebuilt in 2002, with occupants moving back into the completed areas that August. The 184 victims of the attack are memorialized in the Pentagon Memorial adjacent to the crash site. The 1.93-acre (7,800 m2) park contains a bench for each of the victims, arranged according to their year of birth, ranging from 1930 to 1998. On September 10, Nawaf al-Hazmi—accompanied by other hijackers—checked into the Marriott in Herndon, Virginia, near Dulles Airport. N644AA in March 1995 at Ronald Reagan Washington National Airport. Flight 77 was scheduled to depart for Los Angeles at 08:10; 58 passengers boarded through Gate D26, including the five hijackers. The 53 other passengers on board excluding the hijackers were 26 men, 22 women, and five children ranging in age from three to eleven. On the flight, Hani Hanjour was seated up front in 1B, while Salem and Nawaf al-Hazmi were seated in first class in seats 5E and 5F. Majed Moqed and Khalid al-Mihdhar were seated further back in 12A and 12B, in economy class. Flight 77 left the gate on time and took off from Runway 30 at Dulles at 08:20. Three frames from the security camera video of Flight 77 hitting the Pentagon. "The speed, the maneuverability, the way that he turned, we all thought in the radar room, all of us experienced air traffic controllers, that that was a military plane. You don't fly a 757 in that manner. It's unsafe." Security camera footage of Flight 77 hitting the Pentagon. Impact is at 1:27. In all, there were 189 deaths at the Pentagon site, including the 125 in the Pentagon building in addition to the 64 on board the aircraft. Passenger Barbara Olson was en route to a recording of the TV show Politically Incorrect. A group of children, their chaperones, and two National Geographic Society staff members were also on board, embarking on an educational trip west to the Channel Islands National Marine Sanctuary near Santa Barbara, California. The fatalities at the Pentagon included 55 military personnel and 70 civilians. Of those 125 killed, 92 were on the first floor, 31 were on the second floor, and two were on the third. Seven Defense Intelligence Agency civilian employees were killed while the Office of the Secretary of Defense lost one contractor. The U.S. Army suffered 75 fatalities—53 civilians (47 employees and six contractors) and 22 soldiers—while the U.S. Navy suffered 42 fatalities—nine civilians (six employees and three contractors) and 33 sailors. Lieutenant General Timothy Maude, an Army Deputy Chief of Staff, was the highest-ranking military officer killed at the Pentagon; also killed was retired Rear Admiral Wilson Flagg, a passenger on the plane. LT Mari-Rae Sopper, JAGC, USNR, was also on board the flight, and was the first Navy Judge Advocate ever to be killed in action. Another 106 were injured on the ground and were treated at area hospitals. "I don't want to alarm anybody right now, but apparently—it felt just a few moments ago like there was an explosion of some kind here at the Pentagon." "In this area ... it's so hot that the debris is melting and dripping off the ceiling onto your skin and it would sear your skin and melt your uniform. We went a little farther, turned a corner and came into this bombed out office space that was a roaring inferno of destruction and smoke and flames and intense heat you could feel searing your face." Lieutenant Commander David Tarantino describing the scene near the Navy Command Center on the first floor. 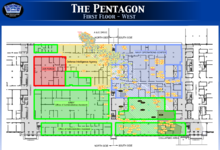 Diagram of body fragments found in the Pentagon. Most body fragments were found near the impact zone. The cockpit voice recorder was transported to the NTSB lab in Washington, D.C., to see what data was salvageable. In its report, the NTSB identified the unit as an L-3 Communications, Fairchild Aviation Recorders model A-100A cockpit voice recorder—a device which records on magnetic tape. No usable segments of tape were found inside the recorder; according to the NTSB's report, "[t]he majority of the recording tape was fused into a solid block of charred plastic". On the other hand, all the data from the flight data recorder, which used a solid-state drive, was recovered. Early estimates on rebuilding the damaged section of the Pentagon were that it would take three years to complete. However, the project moved forward at an accelerated pace and was completed by the one-year anniversary of the attack. The rebuilt section of the Pentagon includes a small indoor memorial and chapel at the point of impact. An outdoor memorial, commissioned by the Pentagon and designed by Julie Beckman and Keith Kaseman, was completed on schedule for its dedication on September 11, 2008. Since September 11, American Airlines continues to fly from Dulles International Airport to Los Angeles International Airport. As of September 2018, flight number 77 has been renumbered to 252, now using a Boeing 737-800, departing at 7:27 in the morning. A photo of the Pentagon Memorial, shortly before it opened on September 11, 2008. 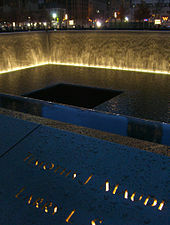 At the National September 11 Memorial, the names of the Pentagon victims are inscribed on the South Pool, on Panels S-1 and S-72 – S-76. ^ David W. Chen (September 19, 2001). "A Nation Challenged: The Suspect – Man Traveled Across U.S. In His Quest to Be a Pilot". The New York Times. Archived from the original on February 8, 2015. Retrieved February 8, 2015. ^ Yardley, Jim; Thomas, Jo (June 19, 2002). "Traces of Terror: The F.B.I. ; For Agent in Phoenix, the Cause of Many Frustrations Extended to His Own Office". The New York Times. Archived from the original on March 17, 2009. Retrieved June 4, 2008. ^ "Four Planes, Four Coordinated Teams". The Washington Post. 2001. Archived from the original on October 23, 2006. Retrieved June 17, 2001. ^ Sennott, Charles M. (March 3, 2002). "Why bin Laden plot relied on Saudi hijackers". The Boston Globe. Archived from the original on May 13, 2008. Retrieved May 29, 2008. ^ a b c d e "The Attack Looms". 9/11 Commission Report. National Commission on Terrorist Attacks Upon the United States. 2004. Archived from the original on October 23, 2013. Retrieved May 29, 2008. ^ Wright, Lawrence (2006). "Chapter 18, "Boom"". Looming Tower. Alfred P. Knopf. ^ Bamford, James; Willis, Scott (February 3, 2009). "The Spy Factory". PBS. Archived from the original on April 11, 2014. Retrieved July 2, 2013. ^ Goldstein, Amy (September 30, 2001). "Hijackers Led Core Group". The Washington Post. Archived from the original on May 5, 2008. Retrieved May 29, 2008. ^ a b "Chronology". Monograph on 9/11 and Terrorist Travel (PDF). National Commission on Terrorist Attacks Upon the United States. p. 22. Archived (PDF) from the original on May 29, 2008. Retrieved May 25, 2008. ^ a b Martin, John P. (September 27, 2001). "Landlord Identifies Terrorists as Renters". The Star-Ledger. ^ Olson, Bradley (September 9, 2006). "MD. Was Among Last Stops For Hijackers; Those Who Recall Encounters Are Haunted By Proximity To Agents Of Tragic Event". The Baltimore Sun. Archived from the original on October 22, 2012. Retrieved May 30, 2008. ^ a b 9/11 Commission (2004). "Notes". 9/11 Commission Report. National Commission on Terrorist Attacks Upon the United States. Archived from the original on May 30, 2008. Retrieved May 30, 2008. ^ Federal Bureau of Investigation (February 4, 2008). "Hijackers' Timeline" (PDF). 9/11 Myths. Archived from the original (PDF) on August 3, 2008. Retrieved August 1, 2008. ^ a b c Isikoff, Michael (February 2, 2011). "WikiLeaks cable revives talk of 9/11 support network". MSNBC. Archived from the original on February 11, 2011. Retrieved February 18, 2011. ^ "FAA Registry (N644AA)". Federal Aviation Administration. ^ "Flight Path Study – American Airlines Flight 77" (PDF). National Transportation Safety Board. February 19, 2002. Archived from the original (PDF) on August 24, 2006. Retrieved May 30, 2008. ^ "FAA REGISTRY". Federal Aviation Administration. Retrieved September 11, 2015. ^ "American Airlines Flight 77". CNN. 2001. Archived from the original on May 12, 2008. Retrieved May 29, 2008. ^ a b c "Staff Monograph on the "Four Flights and Civil Aviation Security"" (PDF). National Commission on Terrorist Attacks Upon the United States. September 2005. Archived from the original (PDF) on November 5, 2007. Retrieved August 14, 2008. ^ a b c d e f g h i j "'We Have Some Planes'". 9/11 Commission Report. National Commission on Terrorist Attacks Upon the United States. 2004. Archived from the original on May 14, 2008. Retrieved May 30, 2008. ^ "The Aviation Security System and the 9/11 Attacks – Staff Statement No. 3" (PDF). National Commission on Terrorist Attacks Upon the United States. Archived (PDF) from the original on May 28, 2008. Retrieved May 30, 2008. ^ a b "New Video of 9/11 hijackers at Dulles Airport before attacks". Anderson Cooper 360. July 21, 2004. CNN. Archived from the original on June 1, 2013. ^ Orecklin, Michele; Land, Greg (November 19, 2001). "Why Argenbright Sets Off Alarms". Time. Archived from the original on August 23, 2013. Retrieved May 30, 2008. ^ a b c "Summary of Flight 77". United States District Court for the Eastern District of Virginia. Archived from the original on February 1, 2014. Retrieved February 4, 2007. ^ Gregor, Joseph A. (December 21, 2001). "ATC Report American Airlines Flight 77" (PDF). National Transportation Safety Board. Archived from the original (PDF) on October 29, 2012. Retrieved September 25, 2011. ^ O'Callaghan, John; Bower, Daniel (February 13, 2002). "Study of Autopilot, Navigation Equipment, and Fuel Consumption Activity Based on United Airlines Flight 93 and American Airlines Flight 77 Digital Flight Data Recorder Information" (PDF). National Transportation Safety Board. Archived from the original (PDF) on June 4, 2011. Retrieved June 1, 2008. ^ a b Phillips, Don (November 3, 2001). "Pentagon Crash Highlights a Radar Gap; Limited System in One Area Made Flight 77 Invisible to Controllers for Half-Hour". The Washington Post. ^ Johnson, Glen (November 23, 2001). "Probe reconstructs horror, calculated attacks on planes". The Boston Globe. Archived from the original on June 8, 2008. Retrieved June 1, 2008. ^ O'Brien, Tim (September 11, 2001). "Wife of Solicitor General alerted him of hijacking from plane". CNN. Archived from the original on March 10, 2013. Retrieved September 25, 2011. ^ Laura Parker (September 13, 2001). "Four flights, four tales of terror". USA Today. Archived from the original on February 8, 2015. Retrieved February 8, 2015. ^ "Air Traffic Controllers Recall 9/11". 20/20. ABC News. October 24, 2001. Archived from the original on September 29, 2013. Retrieved June 5, 2008. ^ Fisher, Marc; Phillips, Don (September 12, 2001). "On Flight 77: 'Our Plane Is Being Hijacked'". The Washington Post. Retrieved June 1, 2008. ^ Schmitt, Eric; Lichtblau, Eric (June 18, 2004). "To the Minute, Panel Paints a Grim Portrait of Day's Terror". The New York Times. Archived from the original on April 9, 2014. Retrieved June 1, 2008. ^ "Flight 77, Video 2". Judicial Watch. Archived from the original on February 12, 2009. ^ "9/11 Survivor Wants Life For Moussaoui". WRC-TV. April 25, 2006. Archived from the original on October 9, 2008. Retrieved June 2, 2008. ^ Curiel, Jonathan (September 3, 2006). "The Conspiracy to Rewrite 9/11". San Francisco Chronicle. Archived from the original on May 19, 2008. Retrieved June 2, 2008. ^ Goldberg et al., p. 14. ^ a b "American Airlines Flight 77 FDR Report" (PDF). National Transportation Safety Board. January 31, 2002. Archived (PDF) from the original on September 7, 2007. Retrieved June 2, 2008. ^ a b c Goldberg, Alfred; et al. (2007). Pentagon 9/11. Washington, D.C.: United States Government Printing Office. p. 17. ISBN 978-0-16-078328-9. ^ a b Mlakar, Paul F.; Dusenberry, Donald O.; Harris, James R.; Haynes, Gerald; Phan, Long T.; Sozen, Mete A. (January 2003). The Pentagon Building Performance Report (PDF). American Society of Civil Engineers. Archived (PDF) from the original on June 24, 2008. Retrieved June 19, 2008. ^ John N. Maclean (August 1, 2008). "America Under Attack". The Washington Post. Archived from the original on February 8, 2015. Retrieved February 8, 2015. ^ Goldberg et al., p. 3. ^ "Phoenix Rising: The Rebuilding of the Pentagon" (Flash). The Washington Post. Retrieved June 2, 2008. ^ Zablotsky, Sarah (June 11, 2003). "Survivor of Pentagon attack has a positive attitude". Pittsburgh Post-Gazette. Archived from the original on December 5, 2011. Retrieved June 2, 2008. ^ Moraes, Lisa (September 17, 2001). "Letterman's Back Tonight, but Don't Expect a Biting Monologue". The Washington Post. ^ "Team from National Geographic Killed in Pentagon Crash". National Geographic Society. September 12, 2001. Archived from the original on May 18, 2008. Retrieved June 10, 2008. ^ Andrea Stone (August 20, 2002). "Military's aid and comfort ease 9/11 survivors' burden". USA Today. Archived from the original on February 8, 2015. Retrieved February 8, 2015. ^ a b Goldberg et al., pp. 23–24. ^ Goldberg, Alfred, Pentagon 9/11, pp. 208–12. ^ "Sept. 11 fallen warrior memorialized in building dedication" (Press release). United States Army. April 30, 2002. Archived from the original on January 3, 2010. Retrieved June 10, 2008. ^ "Mari-Rae Sopper: 9112001". Mari-rae.net. Archived from the original on August 5, 2013. Retrieved April 8, 2014. ^ "'Hardball with Chris Matthews' for May 16". Hardball with Chris Matthews. MSNBC. May 16, 2006. Archived from the original on November 3, 2012. Retrieved May 30, 2008. ^ a b "Terrible Tuesday". The Washington Post. September 16, 2001. ^ a b Borger, Julian (September 12, 2001). "'Everyone was screaming, crying, running. It's like a war zone'". The Guardian. London. Archived from the original on May 16, 2008. Retrieved June 19, 2008. ^ "Documentary Photographs". Library of Congress, Prints and Photographs Division. Archived from the original on November 11, 2006. Retrieved November 12, 2006. ^ Anderson, Porter (September 11, 2001). "Witnesses to the moment: Workers' voices". CNN. Archived from the original on June 30, 2009. Retrieved June 10, 2008. ^ Sheridan, Mary B (September 12, 2001). "Loud Boom, Then Flames In Hallways; Pentagon Employees Flee Fire, Help Rescue Injured Co-Workers". The Washington Post. Retrieved October 12, 2018. ^ "Transcripts – America Under Attack: Eyewitness Discusses Pentagon Plane Crash". CNN. September 11, 2001. Archived from the original on March 19, 2013. Retrieved June 10, 2008. ^ Brennan, Eamonn (September 12, 2011). "John Thompson's surreal 9/11 story". College Basketball Nation Blog. ESPN.com. Archived from the original on April 8, 2014. Retrieved September 16, 2011. ^ Goldberg et al., pp. 55–56. ^ a b Goldberg et al., p. 51. ^ Goldberg et al., p. 72. ^ Goldberg et al., p. 77. ^ Goldberg et al., p. 78. ^ a b "Arlington, Virginia After-Action Report" (PDF). Arlington County Fire Department. Archived from the original (PDF) on September 27, 2007. Retrieved June 10, 2008. ^ a b c d Goldberg et al., pp. 80–82. ^ Goldberg et al., p. 20. ^ a b Goldberg et al., pp. 86–90. ^ a b c Goldberg et al., pp. 91–95. ^ Swift, Earl (September 9, 2002). "Inside the Pentagon on 9/11: The Call of Duty". The Virginian-Pilot (Hampton Roads). Archived from the original on July 30, 2004. ^ "Web Exclusive: Washington's Heroes – On the ground at the Pentagon on Sept. 11". MSNBC. September 28, 2001. Archived from the original on September 10, 2010. ^ Creed, Patrick; Rick Newman (2008). "Chapter 41: A Great Find". Firefight: Inside the Battle to Save the Pentagon on 9/11. Random House. ^ Murray, Frank J. (September 15, 2001). "Pentagon plane voice recorder is too 'cooked' to aid in probe". The Washington Times. ^ "Prosecution Trial Exhibits – Exhibit Number PE00102". United States District Court for the Eastern District of Virginia. Archived from the original on February 9, 2014. Retrieved June 19, 2008. ^ Wilkinson, Marian (September 9, 2002). "Capital punishment". Melbourne: The Age (Australia). Archived from the original on November 14, 2013. Retrieved June 24, 2008. ^ Goldberg et al., p. 97. ^ "Twin Towers Demolished, Pentagon Hit in Terrorist Attacks". Foxnews.com. September 12, 2001. Archived from the original on May 1, 2013. Retrieved June 10, 2008. ^ a b Goldberg et al., p. 119. ^ Eversburg, Rudy (November 1, 2002). "The Pentagon Attack on 9-11: Arlington County (VA) Fire Department Response". Fire Engineering. Archived from the original on January 4, 2014. Retrieved June 10, 2008. ^ Goldberg et al., pp. 121–22. ^ a b c d Vogel, Steve (October 3, 2001). "Search for Remains Ends at Pentagon". The Washington Post. ^ "Mass Fatality Management for Incidents Involving Weapons of Mass Destruction" (PDF). U.S. Army Research Development and Engineering Command and the Office for Domestic Preparedness. August 2005. Archived from the original (PDF) on August 2, 2008. Retrieved June 24, 2008. ^ Kelly, Christopher (November 29, 2001). "Forensic feat IDs nearly all Pentagon victims". Stripe. Archived from the original on May 13, 2011. Retrieved June 27, 2008. ^ Vogel, Steve (November 21, 2001). "Remains Unidentified For 5 Pentagon Victims; Bodies Were Too Badly Burned, Officials Say". The Washington Post. ^ a b Steve Vogel (September 13, 2002). "Lost and, Sometimes, Never Found". The Washington Post. Archived from the original on February 8, 2015. Retrieved February 8, 2015. ^ Rosenberg, Debra (September 28, 2001). "Washington's Heroes: On the ground at the Pentagon on Sept. 11". MSNBC. Archived from the original on May 26, 2004. Retrieved November 2, 2009. ^ "Searchers find Pentagon black boxes". USA Today. Associated Press. September 14, 2001. Archived from the original on February 8, 2015. Retrieved February 8, 2015. ^ "Specialist's Factual Report of Investigation: Cockpit Voice Recorder". National Transportation Safety Board. April 30, 2002. Archived from the original on April 11, 2014. Retrieved November 2, 2009. ^ "Specialist's Factual Report of Investigation: Digital Flight Data Recorder" (PDF). NTSB. January 31, 2002. Archived from the original (PDF) on October 10, 2012. Retrieved February 28, 2014. ^ Vobejda, Barbara (September 11, 2001). "'Extensive Casualties' in Wake of Pentagon Attack". The Washington Post. Archived from the original on July 27, 2011. Retrieved June 20, 2008. ^ Creed, Patrick; Rick Newman (2008). Firefight: Inside the Battle to Save the Pentagon on 9/11. Presidio Press. pp. 276–77. ISBN 978-0-89141-905-1. ^ "Battling the Pentagon Blaze After 9/11". NPR/WHYY – Fresh Air. May 22, 2008. Archived from the original on February 27, 2014. Retrieved June 24, 2008. ^ "DoD News Briefing on Pentagon Attack". United States Department of Defense. September 11, 2001. Archived from the original on June 7, 2008. Retrieved June 24, 2008. ^ "Project Phoenix: Pentagon offices rise from rubble". CNN. September 4, 2002. Archived from the original on June 10, 2009. Retrieved June 24, 2008. ^ Kevin Freking (September 9, 2006). "Public Honors 9/11 Fallen at Pentagon". The Washington Post. Archived from the original on February 8, 2015. Retrieved February 8, 2015. ^ Shaughnessy, Larry (May 24, 2008). "Nearly complete Pentagon memorial tells story of 9/11". CNN. Archived from the original on October 25, 2012. Retrieved September 12, 2011. ^ "Flight Finder ✈ Washington Dulles Intl (KIAD) – Los Angeles Intl (KLAX) ✈ FlightAware". FlightAware. Retrieved March 31, 2016. ^ "Video of 9/11 plane hitting Pentagon is released". MSNBC. Associated Press. May 16, 2006. Archived from the original on January 24, 2013. Retrieved June 10, 2008. ^ "Judicial Watch Obtains September 11 Pentagon Video" (Press release). Judicial Watch. May 16, 2006. Archived from the original on May 11, 2008. Retrieved June 11, 2008. 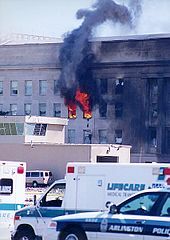 ^ "Images show September 11 Pentagon crash". CNN. March 8, 2002. Archived from the original on May 31, 2008. Retrieved June 11, 2008. ^ "CITGO Gas Station Cameras Near Pentagon Evidently Did Not Capture Attack" (Press release). Judicial Watch. September 15, 2006. Archived from the original on May 1, 2008. Retrieved June 11, 2008. ^ "Videotapes dispel conspiracy; Plane, not missile seen hitting Pentagon on 9/11". The Washington Times. May 17, 2006. ^ "FBI Releases New Footage of 9/11 Pentagon Attack". KWTX-TV. December 4, 2006. Archived from the original on December 8, 2006. Retrieved June 11, 2008. ^ "South Pool: Panel S-74 – Timothy J. Maude". National September 11 Memorial & Museum. Archived from the original on July 27, 2013. Retrieved October 29, 2011. ^ a b c d e Cass, Connie. "Cremated Remains of Pentagon Victims Are Laid to Rest at National Cemetery." Associated Press. September 13, 2002. ^ Pusey, Allen. "Final Service Honors Victims of Pentagon Attack." Dallas Morning News. September 13, 2002. ^ Vogel, Steve. "Lost and, Sometimes, Never Found." Washington Post. September 13, 2002. ^ "Pentagon Memorial Project Schedule". Pentagon Renovation Program. Archived from the original on March 13, 2003. Retrieved October 12, 2006. ^ Miroff, Nick (September 11, 2008). "Creating a Place Like No Other". The Washington Post. The Washington Post Company. Retrieved July 26, 2011. ^ "Pentagon Memorial". Archived from the original on September 10, 2010. Retrieved September 12, 2010. Wikimedia Commons has media related to American Airlines Flight 77.